More than 170 firemen from 10 companies battled the blaze and three firemen were injured or suffered smoke inhalation. Anthony Wayne Sullivan, of shaft volunteer fire company, was treated at Frostburg community hospital four hand lacerations and dismissed. Michael Shirley of the Frostburg fire Dept. was admitted for smoke inhalation. Michael Blanco, a member of the Midland Volunteer Fire Company, was admitted to Sacred Heart Hospital here for observation, suffering from smoke inhalation. His condition was reported as fair. Smoke and water damage was caused to Kiddie Town, Hafer’s Furniture Store, Wheler’s paint and decorating store and Griffith’s, a ladies apparel store. The fire was brought under control at 9 PM but continued to smolder. Clouds of smoke erupted from the burned buildings. 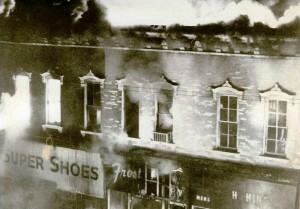 Mrs. Mabel Fisher, who resided over the bakery, reported the fire. Mrs. Fisher has been retired only since the first of the year. The structure housing super shoes was formerly Wittig’s Bowling Alleys in the rear of the building, which extends to Mechanic Street, had been she in metal siding with a metal roof, with only one window and a door opening into the rear of the storeroom from Mechanic Street. By the time firemen were able to concentrate hoses on the rear of the building, the interior, filled with leather, plastic, rubber and cloth goods was a single mass of flames. For several hours, water being directed into the mass of flames turned to steam almost before it entered the structure. See more pictures on our Facebook Page – Bakery Album.